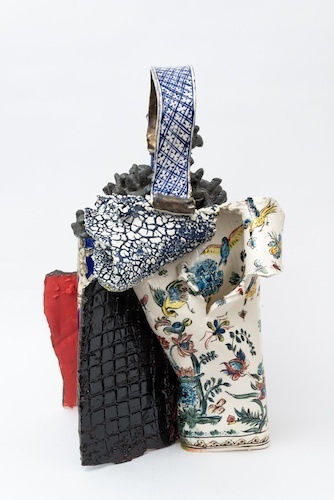 Francesca DiMattio, Putti Vase, 2013, underglaze, gold luster, and enamel on porcelain, 23 x 12 1/4 x 12 1/2." This transmogrification is, on a base level, a metonym for the process of creating a vessel from clay, as well as an archetype for the kind of ceramic pieces on display. These are vessels from the hands of artists who long ago abandoned functionality for form: A flurry of extra handles sprout all over Beverly Semmes’s fire engine–red Smoke, 2012, and wings of Matisse-like color and clay are sutured to Woodman’s Vase Upon Vase: Bella and Vase Upon Vase: Joy (both 2011). Francesca DiMattio’s pieces are perhaps the most formally driven, as functional vases are broken and fused to other vessels with riotously textured materials to create new, almost impossible forms. Putti Vase, 2013, for instance, is a discordance of premade ceramic pieces, lumped and burned together in a clamor of colorful protrusions, while the vase in question in Staffordshire Vase, 2013, is fused to another piece of porcelain among a litany of baby-blue forms, writhing from the ether into life.